An open conflict will likely erupt imminently between Turkey and the U.S.-backed Syrian Democratic Forces (SDF) in the town of Manbij in Northern Syria. Turkey considers the Syrian Kurdish YPG – the main component of the SDF - to be an extension of the outlawed Kurdistan Workers’ Party (PKK), which is currently waging an insurgency in Southern Turkey. The fight for Manbij will derail the U.S.-backed campaign against ISIS and create opportunities for al Qaeda to expand further in Syria. The U.S. must reduce its dependence upon both Turkey and the Syrian Kurdish YPG. Turkish President Recep Erdogan has repeatedly stated his intent to expel the Syrian Kurdish YPG – the main component of the SDF – from Manbij to the Euphrates River’s eastern bank. Turkish President Recep Erdogan reiterated on February 28 that Turkish-backed opposition groups in Operation Euphrates Shield will advance against Manbij in Eastern Aleppo Province after they finish consolidating control over Al-Bab, located twenty five miles to the west. Turkish-backed forces in Operation Euphrates Shield seized Al-Bab in Northern Aleppo Province on February 23 after ISIS withdrew from the city and its environs toward Ar-Raqqa City. The end of combat operations in Al-Bab frees Erdogan to pursue his strategic aim to roll back the de-facto contiguous autonomous zone controlled by the YPG along the Syrian-Turkish Border. The U.S. reportedly gave a deadline of February 27 for Turkey to present an alternative operational plan to seize Ar-Raqqa City as part of a wider review of the campaign against ISIS due to U.S. President Donald Trump on the same day. Turkey proposed inserting opposition forces into Tel Abyad in Northern Ar-Raqqa Province and forming a ‘corridor’ through terrain held by the SDF as part of a its preferred plan for an offensive against Ar-Raqqa City during a meeting between Turkish Chief of the General Staff Gen. Hulusi Akar and U.S. Chairman of the Joint Chiefs of Staff Gen. Joseph Dunford on February 17. Senior U.S. officials remain unwilling to contemplate proposals to exclude the SDF from operations against Ar-Raqqa City despite high-level lobbying by Turkey. Instead, U.S. Secretary of Defense Gen. James Mattis met with Turkish Defense Minister Fikri Isik on February 15 and offered increased intelligence support for operations against the PKK in Northern Iraq. Erdogan has already demonstrated his willingness to take actions in Syria that undermine U.S. policy positions and admonitions. Turkey threatened to partner with Russia to conduct joint airstrikes against ISIS in Al-Bab, and then did so after the U.S. ignored its repeated requests for air support. The U.S. has taken overt actions to deter an attack by Turkey and reaffirm its support for the SDF over the past several weeks given the growing risk of a direct military conflict. U.S. Central Command (CENTCOM) Commander Gen. Joseph Votel and Operation Inherent Resolve Commander Lt. Gen. Stephen Townsend met with senior SDF leaders in Northern Syria on February 24. Anonymous sources claimed that the U.S. pledged to protect Manbij against attacks from Turkey. CENTCOM denied any such assurances. CENTCOM publicized several photos over the past week highlighting the role of the Manbij Military Council (MMC) in the campaign against ISIS in Northern Syria. The MMC is a component of the Syrian Democratic Forces that retains close organizational ties to the Syrian Kurdish Democratic Union Party (PYD) - the political wing of the YPG. The U.S. led a field inspection with a delegation from the Turkish Armed Forces in December 2016 to demonstrate that the YPG had withdrawn completely from Manbij. Turkish Foreign Minister Mevlut Cavusoglu later stated that the visit failed to satisfy concerns that the town remains controlled by proxies of the group. Thousands of residents held demonstrations in Manbij on February 13 calling for the release of imprisoned PKK founder Abdullah Ocalan. Unconfirmed activist reports claim that some of the 500 U.S. Special Operations Forces (SOF) currently present in Northern Syria may have been deployed to frontlines on the Sajur River near Manbij within the past several days in order to deter further aggression by Turkey. Turkish leaders met on February 27 and likely made the decision to proceed with operations against Manbij rather than wait on coalition support for an offensive against ISIS in Ar-Raqqa City. Erdogan called unscheduled meetings with Turkish Defense Minister Fikri Isik and Turkish Chief of the General Staff Gen. Hulusi Akar in Istanbul on February 27. Turkish Presidential Advisor Ilnur Cevik claimed on February 27 that Turkey plans to end its military operations in Syria after establishing a fifty-mile “buffer zone” in Manbij. Turkey has continued to deploy additional armored vehicles to Northern Aleppo Province in recent weeks. These reinforcements could be deployed against Manbij as well as the isolated Kurdish Afrin Canton in Western Aleppo Province. Further escalation between Turkey and the Syrian Kurds would severely jeopardize – and likely halt indefinitely - the campaign against ISIS in Ar-Raqqa City. The U.S. has relied extensively upon the YPG as the main component of the SDF – the preferred coalition partner on the ground against ISIS in Northern Syria. Open fighting between Turkey and the SDF would allow ISIS to retain its hold on Ar-Raqqa City and potentially secure new gains across Northern Syria. The U.S. must exercise all of its sources of leverage over Turkey – including its military presence in Syria as well as bilateral military-to-military assistance, humanitarian support, and economic investment – in order to prevent a Turkish offensive against the SDF. The U.S. should also consider slowing down or halting further SDF advances in order to avoid fueling a wider conflict between Arabs and Kurds in Northern Syria. The U.S. must not sacrifice long-term stability for a quick victory against ISIS in Ar-Raqqa City. The U.S. must ultimately build an alternative partner force of Syrian Sunni Arabs that is both willing to fight Salafi-jihadi groups and is independent from the political project of the PYD. The U.S. cannot rely upon the Turkish-backed opposition force due to its inclusion of Salafi-jihadi groups, including Ahrar al-Sham, that serve as a vector for al Qaeda in Syria. 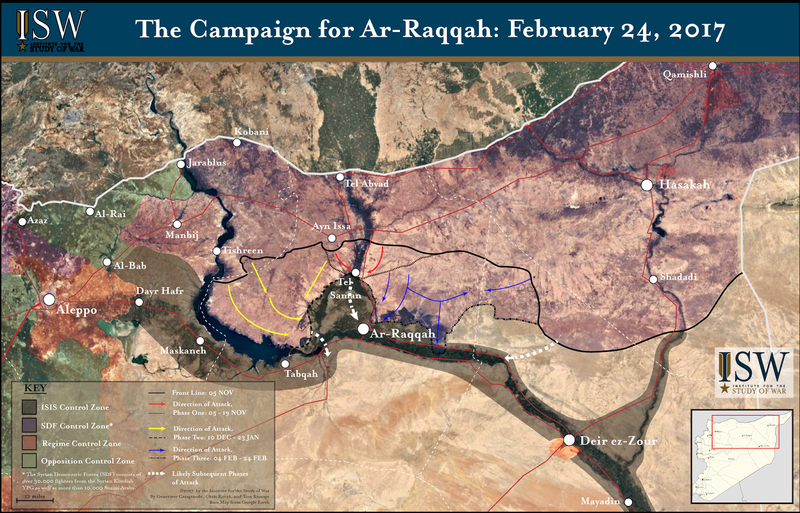 24 FEB 2017: “The Campaign for Ar-Raqqa: February 24, 2017,” Tom Ramage, Institute for the Study of War. 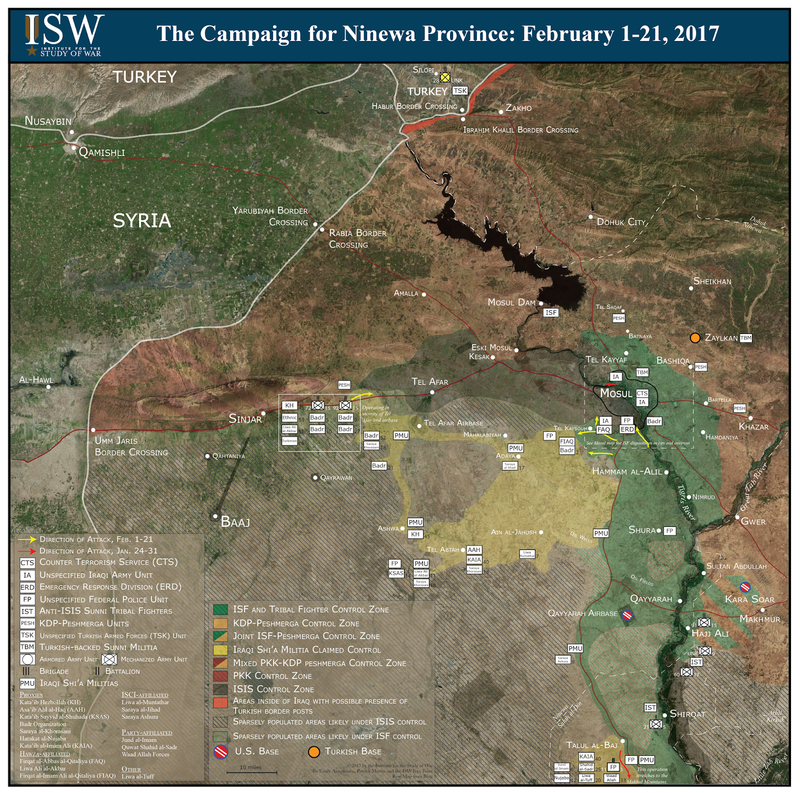 13 FEB 2017: “Warning Update: Turkish Aggression Against Syrian Kurds Threatens to Halt U.S. Anti-ISIS Operations in Syria,” Tom Ramage, Institute for the Study of War. 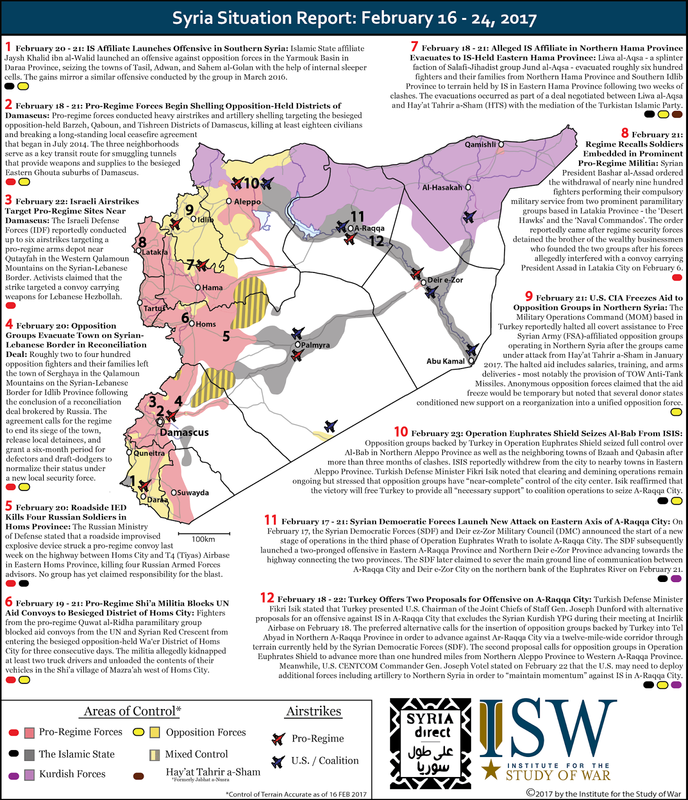 22 NOV 2016: “The Road to Ar-Raqqah: Background on the Syrian Democratic Forces,” Genevieve Casagrande, Institute for the Study of War. 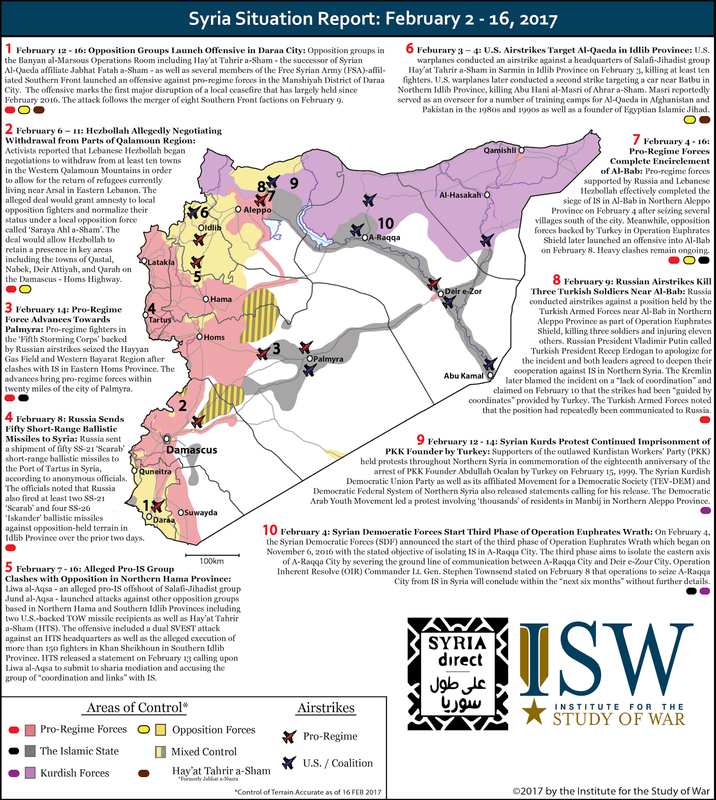 30 AUG 2016: “Turkish Incursion in Northern Syria Signals Turning Point in Anti-ISIS Fight,” Jennifer Cafarella with Leah Danson, Institute for the Study of War. 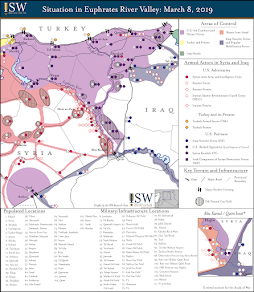 10 JUN 2016: “The Competing Campaigns Against ISIS in Northern Syria,” Christopher Kozak, Institute for the Study of War. ISIS could be facing difficulty coordinating successful attacks in Iraq as losses in Mosul are forcing it to transform from a governing to guerrilla style terrorist organization. 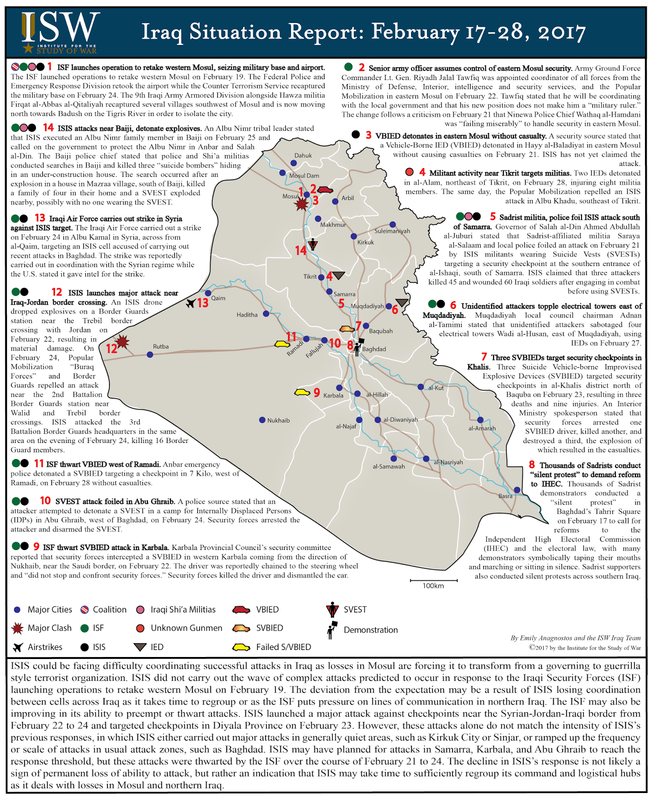 ISIS did not carry out the wave of complex attacks predicted to occur in response to the Iraqi Security Forces (ISF) launching operations to retake western Mosul on February 19. The deviation from the expectation may be a result of ISIS losing coordination between cells across Iraq as it takes time to regroup or as the ISF puts pressure on lines of communication in northern Iraq. The ISF may also be improving in its ability to preempt or thwart attacks. ISIS launched a major attack against checkpoints near the Syrian-Jordan-Iraqi border from February 22 to 24 and targeted checkpoints in Diyala Province on February 23. However, these attacks alone do not match the intensity of ISIS’s previous responses, in which ISIS either carried out major attacks in generally quiet areas, such as Kirkuk City or Sinjar, or ramped up the frequency or scale of attacks in usual attack zones, such as Baghdad. 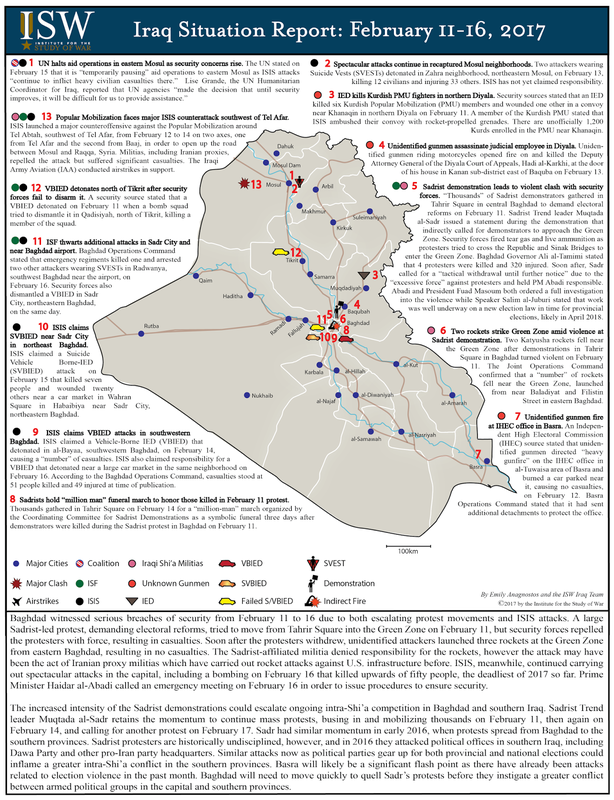 ISIS may have planned for attacks in Samarra, Karbala, and Abu Ghraib to reach the response threshold, but these attacks were thwarted by the ISF over the course of February 21 to 24. The decline in ISIS’s response is not likely a sign of permanent loss of ability to attack, but rather an indication that ISIS may take time to sufficiently regroup its command and logistical hubs as it deals with losses in Mosul and northern Iraq. Update: The Syrian regime seized additional towns from ISIS southeast of al-Bab on 27 FEB 2017 after ISIS withdrew. Regime control now abuts US-backed Syrian Democratic Forces and also Turkish-backed opposition forces. ISIS will continue to launch spectacular attacks along this seam at which the interests of local and global anti-ISIS actors compete directly. Key Takeaway: ISIS launched offensives against the Syrian regime in Deir ez Zour, eastern Homs province, and eastern Damascus province in January 2017, exploiting the regime’s focus on Aleppo and attempting to offset or divert regime operations near al-Bab. Regime forces began to reverse ISIS’s gains in Homs province on February 14. 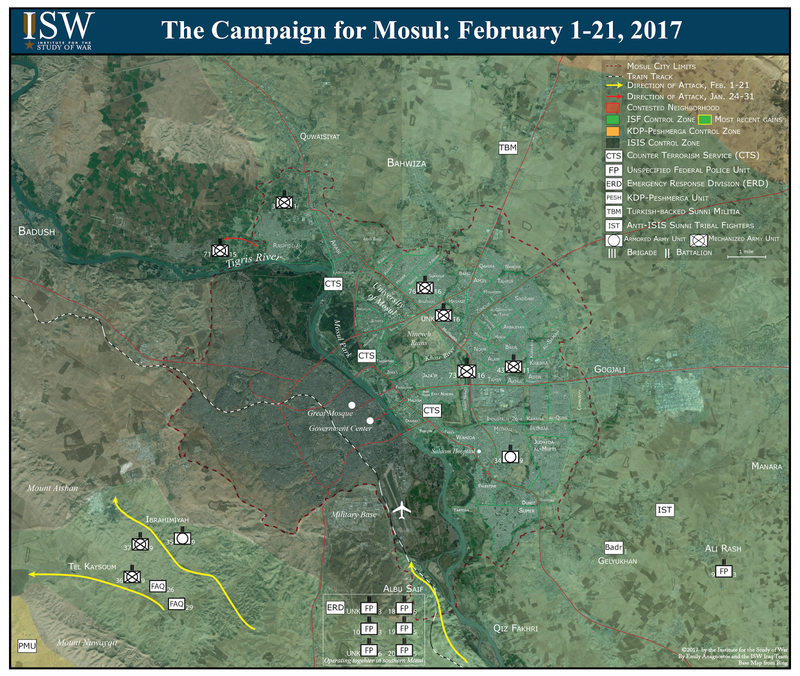 ISIS lost additional territory in Mosul to the U.S.-led anti-ISIS coalition in early 2017. ISIS also lost al-Bab, Syria to Turkish-backed Operation Euphrates Shield on February 23. ISIS may increasingly infiltrate opposition-held territory in northwest Syria as U.S.-backed, Kurdish-dominated Operation Euphrates Shield threatens its control of Raqqa. ISIS-linked opposition group Liwa al-Aqsa conducted numerous attacks in northern Hama and southern Idlib provinces against opposition groups in early 2017, especially those affiliated with al-Qaeda’s de facto affiliate in Syria, Hay’at Tahrir al-Sham. Liwa al-Aqsa subsequently negotiated a withdrawal from villages in northern Hama province, which may remain an attack zone for ISIS. ISIS’s affiliate in southwest Syria, Jaysh Khalid ibn al-Walid, also seized towns in Dera’a province in February, exploiting the focus of local opposition groups on an offensive in Dera’a City. 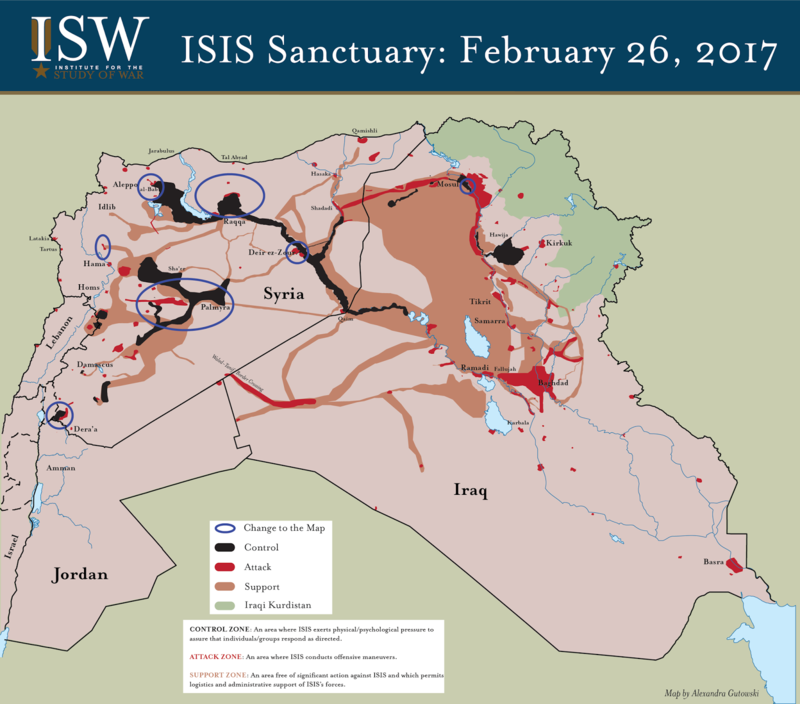 ISW is placing a watch on ISIS in Damascus province and in Jordan, where ISIS may have latent potential to launch attacks in response to further losses in Raqqa and Mosul. A depiction of ISIS sanctuary in Jordan is forthcoming. ISIS launched offensives against the Syrian regime in Deir ez Zour, eastern Homs province, and eastern Damascus province in January 2017, exploiting the regime’s focus on Aleppo and attempting to offset or divert regime operations near al-Bab. Regime forces began to reverse ISIS’s gains in Homs province on February 14. 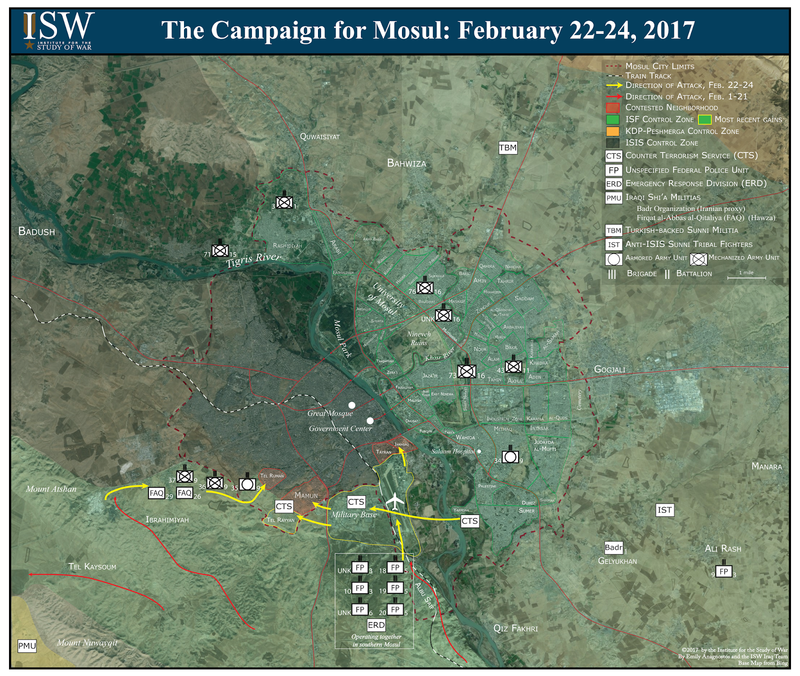 ISIS lost additional territory in Mosul to the U.S.-led anti-ISIS coalition in early 2017. ISIS also lost al-Bab, Syria to Turkish-backed Operation Euphrates Shield on February 23. ISIS may increasingly infiltrate opposition-held territory in northwest Syria as U.S.-backed, Kurdish-dominated Operation Euphrates Shield threatens its control of Raqqa. ISIS-linked opposition group Liwa al-Aqsa conducted numerous attacks in northern Hama and southern Idlib provinces against opposition groups in early 2017, especially those affiliated with al-Qaeda’s de facto affiliate in Syria, Hay’at Tahrir al-Sham. Liwa al-Aqsa subsequently negotiated a withdrawal from villages in northern Hama province, which may remain an attack zone for ISIS. ISIS’s affiliate in southwest Syria, Jaysh Khalid ibn al-Walid, also seized towns in Dera’a province in February, exploiting the focus of local opposition groups on an offensive in Dera’a City. 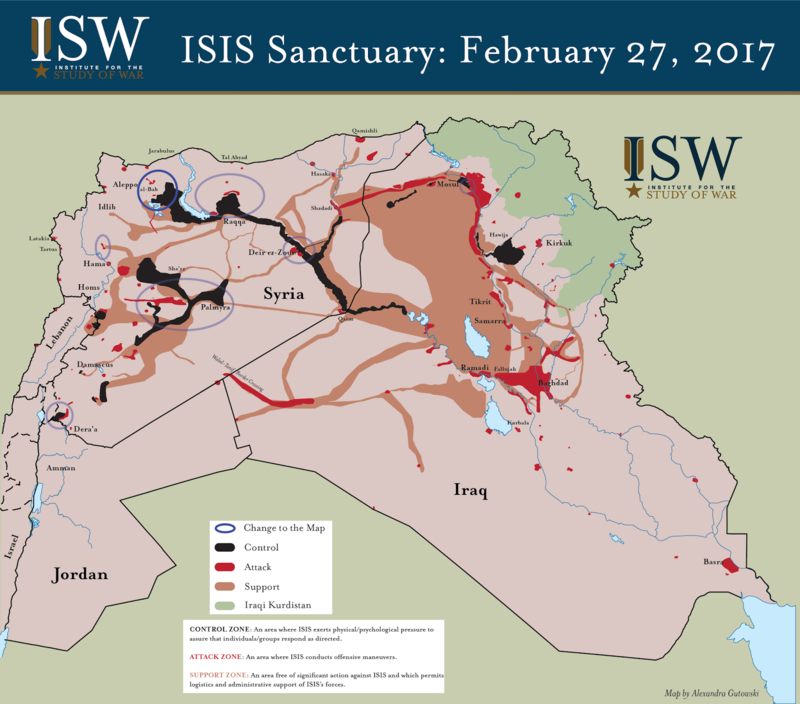 ISW is placing a watch on ISIS in Damascus province and in Jordan, where ISIS may have latent potential to launch attacks in response to further losses in Raqqa and Mosul. A depiction of ISIS sanctuary in Jordan is forthcoming. Key Takeaway: The Syrian Kurdish-led Syrian Democratic Forces (SDF) have seized the majority of ISIS-held territory in the eastern countryside of ar-Raqqah and is positioned to complete the isolation of the city in coming months. The U.S.’s main partners in Syria, the SDF and Turkey, are competing to lead the next phase of operations to seize ar-Raqqah City and thereby solidify their influence over post-ISIS governance. The SDF are currently the U.S. partner force best positioned to seize the city and have begun establishing governance structures comprised of local allied Arab leaders. Turkey’s alternative proposals for a Turkish-approved force to seize ar-Raqqah City risk an armed conflict with the SDF or pro-regime forces as well as the empowerment of Salafi-Jihadi group Ahrar al-Sham. The U.S. must work with its allies to both prevent an armed conflict between Turkey and the SDF that would detract from current anti-ISIS operations and while simultaneously setting conditions to ensure a representative governance structure for post-ISIS ar-Raqqah City. The Syrian Kurdish-led Syrian Democratic Forces (SDF) have seized the majority of ISIS-held territory in the eastern countryside of ar-Raqqah in ongoing efforts to isolate the city. The SDF launched the third phase of Operation Euphrates Wrath on February 4 with the stated objective of seizing the eastern countryside of ar-Raqqah City. The SDF attacked south towards ar-Raqqah City along two axes from SDF-held territory east of the town of Ayn Issa, reportedly seizing 98 villages and hamlets northeast of ar-Raqqah City by February 12. The SDF connected these two axes on February 11 and was approximately 5 km northeast of ar-Raqqah City as of February 17. The SDF subsequently announced the second stage of phase three on February 17 and launched two axes of attack in a pincer movement to seize the Raqqa-Hasakah highway and encircle ISIS-held territory in Northern Deir ez Zour Province. The SDF simultaneously advanced south from newly seized territory on the Raqqah-Hasakah highway and seized the village of Judaydat Khabour on February 21, thereby weakening ISIS’s ability to resupply ar-Raqqah City. The SDF are now positioned to complete the isolation of ar-Raqqah City and subsequently transition to the next phase of seizing the city. The U.S.’s main partners in Syria, the SDF and Turkey, are competing to lead operations to seize ar-Raqqah City and solidify their influence over post-ISIS governance. The SDF are currently advancing towards the city with increased U.S. material support, and have requested heavy weapons and additional armored vehicles to counter ISIS’s strength in urban combat. The SDF and affiliated political parties have also begun solidifying relationships and alliances with local Arab tribal leaders in order to create a governance structure of SDF-friendly local notables similar to the structure established by the SDF in Manbij City. Turkey, meanwhile, has demanded that the U.S. end its support for the SDF and proposed two alternative plans for a Turkish approved force to seize ar-Raqqah City. Turkey’s plans, however, will likely not beas effective in combating ISIS in ar-Raqqah City as a U.S.-supported SDF assault on the city and will fail to achieve U.S. strategic objectives for Syria. The first plan to advance along a 12-mile wide corridor from the town of Tal Abyad to ar-Raqqah City would bisect SDF-held territory east of the Euphrates. The SDF will not concede to this plan without major U.S. guarantees or Turkish concessions, and may launch counter-attacks if Turkey proceeds unilaterally. Turkey’s second proposal is an offensive from the recently seized town of al Bab, which would require Turkish troops to advance approximately 100 miles and seize at least two heavily fortified ISIS-held towns before reaching ar-Raqqah City. This second proposal violates a reported agreement between Turkey and Russia preventing Turkish troops from advancing south of al Bab, and pro-regime forces have already begun advancing east towards Lake Assad in an effort to prevent Turkish-backed opposition groups from seizing vast territory. Turkish-backed opposition groups acceptable to the U.S. likely [DS1] cannot seize ar-Raqqah City without additional support from prominent Salafi-Jihadist group Ahrar al Sham. Turkey used Ahrar al Sham during the offensive on al Bab to seize territory when other Turkish backed opposition groups proved unable to effectively combat ISIS in and around the urban terrain. Turkey will likely utilize Ahrar al Sham in a leading role in a Turkish offensive on ar-Raqqah City. Ahrar al Sham’s seizure of the city would likely allow the group to dictate the composition of ar-Raqqah City’s governance structure, effectively trading control of ar-Raqqah from one Salafi-Jihadist group to another. A governance structure established by Ahrar al Sham is antithetical to U.S. strategic interests in Syria. A U.S. failure to prevent conflict between its Kurdish- and Turkish-led partner forces in Syria could jeopardize the anti-ISIS mission in Syria. A Turkish attack on Manbij City or an attempt to bisect Kurdish territory could instigate a wider armed conflict that would distract both major U.S.-partner ground forces from the anti-ISIS fight in ar-Raqqah City. The U.S. must also set conditions to prevent the resurgence of Salafi-Jihadism after the seizure of ar-Raqqah City by ensuring that the city is governed by representatives of its population rather than another Salafi-Jihadist group or a Kurdish puppet. Baghdad witnessed serious breaches of security from February 11 to 16 due to both escalating protest movements and ISIS attacks. A large Sadrist-led protest, demanding electoral reforms, tried to move from Tahrir Square into the Green Zone on February 11, but security forces repelled the protesters with force, resulting in casualties. Soon after the protesters withdrew, unidentified attackers launched three rockets at the Green Zone from eastern Baghdad, resulting in no casualties. The Sadrist-affiliated militia denied responsibility for the rockets, however the attack may have been the act of Iranian proxy militias which have carried out rocket attacks against U.S. infrastructure before. ISIS, meanwhile, continued carrying out spectacular attacks in the capital, including a bombing on February 16 that killed upwards of fifty people, the deadliest of 2017 so far. Prime Minister Haidar al-Abadi called an emergency meeting on February 16 in order to issue procedures to ensure security. Key Takeaway: The U.S.-led coalition’s fight against ISIS in Syria is in jeopardy as Turkey threatens an offensive against the U.S.’s primary partner force on the ground, the Syrian Democratic Forces. Turkey has stated its intent to shift its focus from ISIS to the Syrian Kurds after the seizure of the ISIS-held town of al Bab in Northern Aleppo Province, which ISW forecasts is likely in the coming weeks. If the U.S. fails to protect its partner force, the Syrian Kurdish-led de facto government of Northern Syria may pursue closer cooperation with Russia, which could hinder the U.S.’s ability to influence the outcome of the Syrian Civil War and continue its operations in the country. Conflict between the U.S.’s allies in Northern Syria will also relieve pressure on ISIS in Raqqa Province and thereby allow ISIS to seize territory from the Syrian regime or reinforce its core terrain in Iraq. Turkey’s threat to launch an offensive against the Syrian Democratic Forces (SDF) after the impending seizure of al Bab endangers the U.S.-led coalition’s fight against ISIS in Syria. Turkish Armed Forces (TSK) and Turkish-backed opposition groups entered the ISIS-held town of al Bab in Northern Aleppo Province on February 9 following a two and a half month offensive on the town. Pro-regime forces severed ISIS’s last remaining ground line of communication south of al Bab on February 6, and ISW forecasts that the city will likely fall in the coming weeks. Turkish President Recep Erdogan stated on January 27 that the Turkish Armed Forces and Turkish-backed opposition groups will not advance further south following the seizure of al Bab, but rather will launch an offensive against the SDF in Manbij City to push the SDF east of the Euphrates. The U.S. is relying on the SDF as the only U.S.-led coalition partner force currently capable of isolating ISIS’s de-facto capital in Syria – ar-Raqqah City. A Turkish offensive that both distracts and weakens the U.S.’s partner force in Syria will diminish the U.S.’s ability to combat ISIS in Syria. Turkish officials have consistently announced their hostility towards the dominant group in the political alliance behind the SDF, the Syrian Kurdish Democratic Union Party (PYD), due to its links to the Kurdistan Workers' Party (PKK), a U.S.-designated terrorist organization. Turkey launched Operation Euphrates Shield, currently a TSK and Turkish-backed opposition offensive against ISIS in Northern Aleppo Province, in large part to prevent the formation of a contiguous zone of control along the Syrian-Turkish border de facto governed by the PYD. In addition, TSK and Turkish-backed forces recently increased attacks against the SDF in Northern Aleppo Province, indicating that Turkey is preparing to escalate its currently low-scale conflict with the SDF. Turkey is also using arrests of alleged ‘PYD militants’ in Turkish-held Northern Aleppo Province and Turkey to reinforce Turkey’s designation of the PYD as a terrorist organization and legitimize their potential offensive. Turkish President Recep Erdogan is likely timing its assault on the SDF in Northern Aleppo Province in conjunction with preparations to hold a referendum on a constitutional amendment package that would increase his executive powers. A Turkish offensive on the SDF will demonstrate Erdogan’s commitment to Turkey’s ongoing anti-PKK campaign, which is likely to increase popular support for the proposed constitutional amendments. Turkish officials likely also see U.S. President Donald Trump’s reported rejection of previous plans to increase support for the SDF as well as his recent phone conversation with Erdogan as indicators that the new administration is open to sacrificing support for the SDF in exchange for a closer partnership with Turkey in Syria. A Turkish offensive to drive the SDF east could divert Turkish and SDF resources from combatting ISIS for months. The U.S. will likely attempt to hedge this effect by offering Turkey a leading role in operations to seize ar-Raqqah City. A Turkish offensive would require SDF approval to traverse Kurdish-held terrain, however, otherwise Turkish forces would have to advance approximately 100 miles through ISIS-held territory before attacking ar-Raqqah City. The PYD is opposed to allowing Turkey to establish a governing structure in ar-Raqqah City that is hostile to its goal of establishing a federal system in post-war Syria. The PYD is currently creating local governance structures for the city and the surrounding region with the support of local Arab tribal leaders in order to demonstrate the viability of its proposed governance structure and establish allied control over the region. Moreover, the extended Turkish assault on the ISIS-held town of al Bab demonstrates that Turkish-backed opposition forces are not independently combat capable of seizing ISIS-held urban terrain. A successful Turkish assault on ar-Raqqah City would require an increased commitment of TSK troops or the use of prominent Salafi-jihadi group Ahrar al Sham in addition to the full support of the U.S.-led coalition. Most dangerously, a halt to the SDF’s operations against ISIS could allow the group to retake territory in Northern Syria, divert forces to its assault on pro-regime held Deir ez-Zour City, or send reinforcements to defend Mosul City in Iraq. The PYD may turn to Russia as an alternate patron if the U.S. fails to prevent an offensive against the SDF or attempt to allow Turkey a greater role in the ar-Raqqah offensive. Russia has attempted to reconcile the PYD with its rival Syrian Kurdish political parties in the Kurdish National Council and the Syrian regime in the past. Russia is also hosting a pan-Kurdistan meeting in Moscow on February 15 to reportedly discuss ways to foster Kurdish unity and PYD requirements for a post-war Syrian constitution. The PYD has already allowed Russian military police to patrol its controlled districts within Aleppo City and currently shares territory with pro-regime forces in Northern Aleppo Province west of the town of al Bab. The regime also reportedly delivered twenty-five tons of ammunition to the SDF on October 13 before the SDF launched operations against ISIS in ar-Raqqah City. 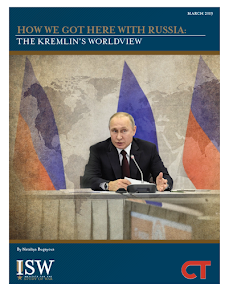 Russian mediated reconciliation between the regime and the PYD would be a major political coup against U.S. influence in Syria, effectively pushing the U.S. further out into the fringes of being able to affect both the Syrian Civil War and the fight against ISIS in Syria. Turkey may indicate an upcoming offensive by deploying further TSK reinforcements to the towns of Jarablus and Azaz in Northern Aleppo Province. An escalation in clashes between Turkish-backed opposition groups and the SDF in Northern Aleppo Province will also indicate that Turkey is shifting the focus of its operations in Syria from ISIS to the SDF. Syrian Kurds could show signs of drifting to Russia’s sphere of influence by accepting Russia’s offered concessions in a potential post-war Syrian constitution or taking increasingly frequent meetings with Russian officials.